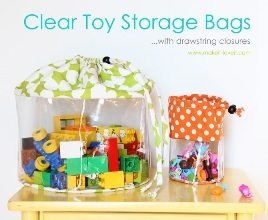 Ashley from Make It and Love It shares a tutorial on her blog showing how to make her Clear Toy Storage Bags. The clear vinyl around the middle of the bag makes it easy to see what’s inside and a happy cotton print across the top and bottom add a pop of color. The drawstring closure is easy to sew and easy for small hands to use. Get the tute.